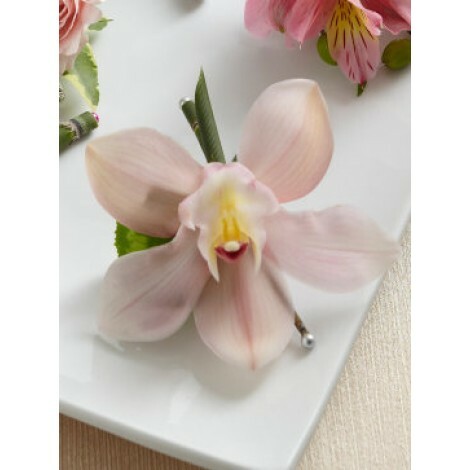 This striking and simplistic soft pale pink orchid boutonniere is one of natural beauty, elegance and charm. 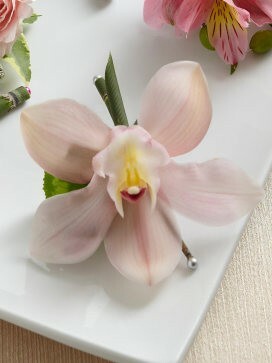 Featuring; A single cymbidium orchid bloom is secured to an equisetum stem and accented with a classic cyclamen leaf. Resulting in a truly stylish and sophisticated, very effective finishing touch. Approximate dimensions; 4"H x 4"W.